Our dedicated team are here to diagnose and treat illnesses and ailments, provide management of long-term conditions in specialist clinics, and promote well being through health education. We also provide various additional services such as contraception, vaccinations, smear tests, child health surveillance and maternity services. Where appropriate and after consultation we provide various investigations and treatments including blood tests, heart traces, joint injections and minor surgery. We aim to provide excellent clinical care, working with the Clinical Commissioning Group to ensure we have a viable cost effective NHS for the future. We will continue to train tomorrow's Doctors and Primary care clinicians. We are accredited as a University Teaching Practice by Cambridge University for teaching Medical students. We are a Post Graduate Training Practice for the East of England Multi Professional Deanery. Please be mindful of the local Clinical Commissioning group Choose Well Campaign to help decide on options from where you may access care depending on the ailment. There are a number of useful fact sheets on this website for many minor ailments which will help you to self manage and advice on symptoms that would prompt you to see a health professional. These include, headaches, sore throat, earache, sprain and strains, constipation, heartburn and more. Would you recommend us to your friends and family? 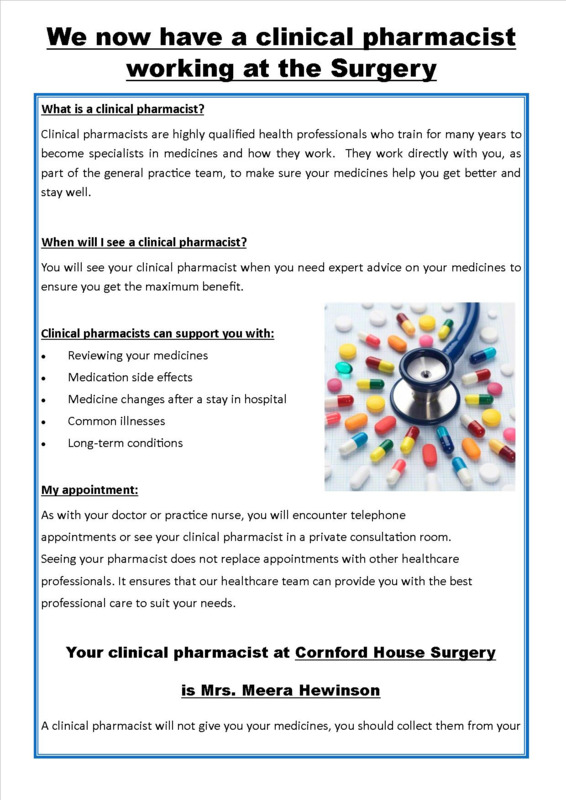 Cornford House Surgery and Fulbourn Health Centre want you to have the best possible experience of care. The NHS Friends and Family Test is a way of gathering your feedback so we can continually review our service. Your feedback will help us learn more about what you think of your experience – what you like and what you think we could improve. Ultimately you’re helping us to make changes that will ensure we can offer the best possible care.